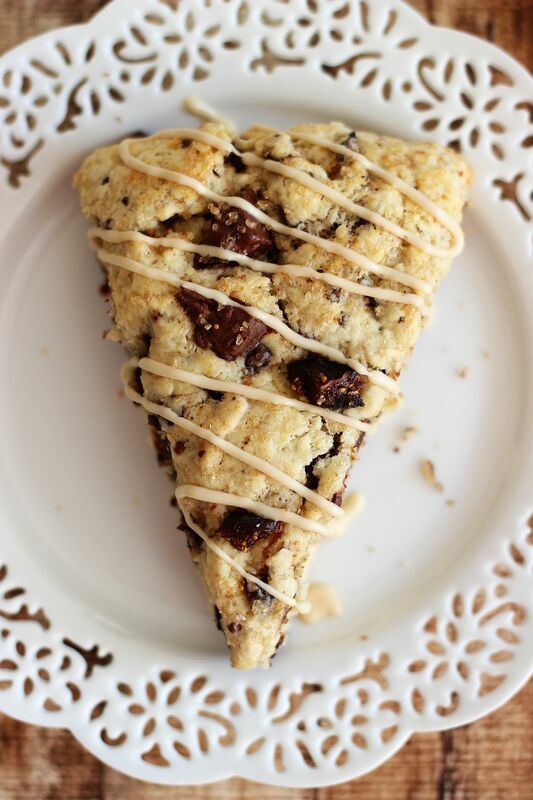 Tender and moist scones chock-full of chocolate covered bacon, crushed espresso beans, and coffee-soaked figs. I know how these sound. I swear they just sound weirder than they are. This is one of those instances where you’ll have to reaaally find it in yourself to trust me. 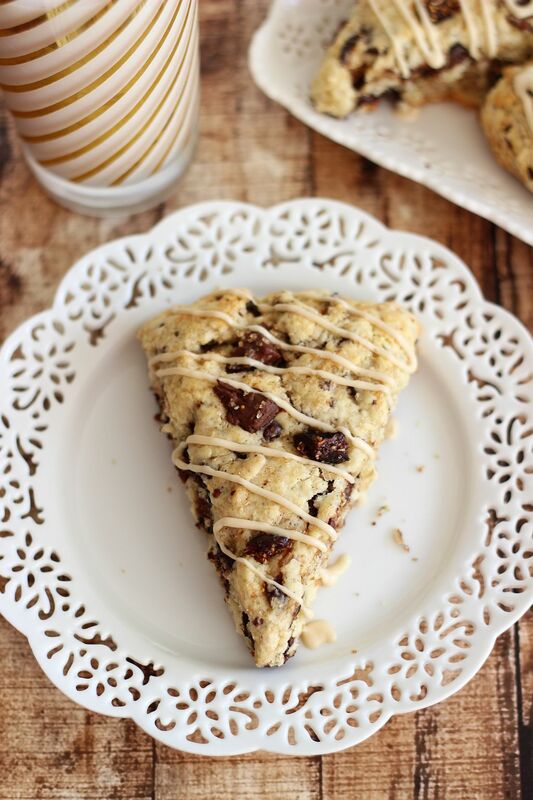 I have no earthly idea where this idea came from or why I thought chocolate covered bacon belonged in scones, but it happened. Why question it? Do we even want to retrace that thought process? Probably not. They exist now, and that’s all we need to know. I’m sure you read the title, squinted a little in skepticism, and then thought: “Huh. Interesting.” Or maybe it’s optimistic of me to suggest that you could think these sound ‘interesting.’ Maybe you think these are not at all interesting and are just straight up weird. Too strange. Fair enough… I could see that. Or maybe you’re like me, and you saw “Chocolate Covered Bacon,” stopped in your tracks, and didn’t care what the rest of the title was. 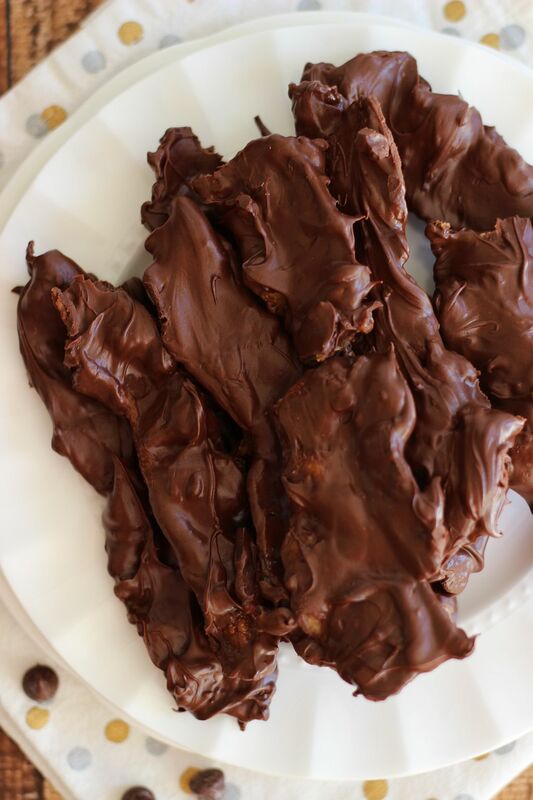 You’ve already seen the most important piece: CHOCOLATE COVERED BACON, and you were on board right from that point. That’s what I was banking on when I carried out this idea. Maybe that was misplaced hopefulness! Either way, these happened and they were awesome. I love that they are off-the-wall, but that the flavors all still come together perfectly. 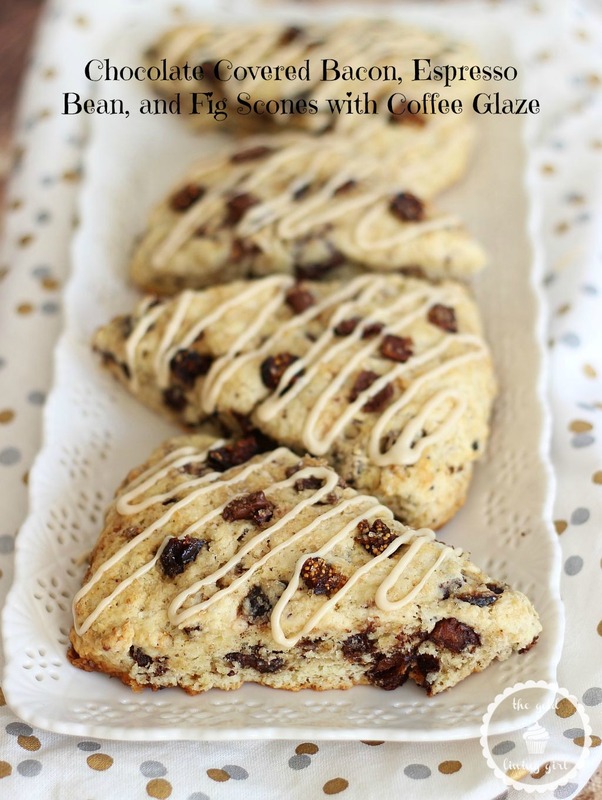 They’re a little more work than the other scone recipes I’ve posted on the blog that can typically be made in 30 minutes, start-to-finish. These require more prep. All worth it. I used to think of scones as so dry and bland, but since learning to make them from scratch, I’ve become smitten. They’re an underrated baked good, no doubt about that. 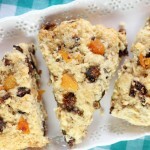 When done right, scones are soft and tender in the middle, and have nice crispy edges. They’re airy and flaky and moist. They’re also typically very easy and versatile. Except for these. As I hinted, these are slightly more work. You are probably wondering if the bacon really needs dunked in chocolate first. Yes, it does. 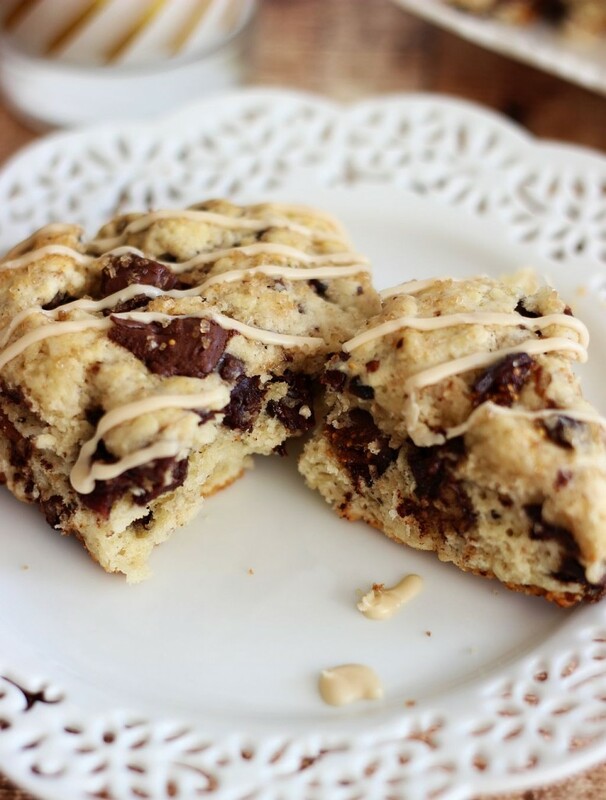 I made these scones with plain cooked bacon that was not doused in chocolate, and then just added chocolate chips. It was not quite the same. Dunk the bacon in chocolate – the flavor impact is just so much better. The good thing about this step is that the dunked bacon doesn’t have to look pretty! We chop it up anyway, so no need for the perfect chocolate coating… which, is pretty much impossible anyway. Bacon is all curly and stuff, ya know? And the figs – they need to soak in the coffee. It matters. It just lends a deeper and richer flavor to the figs. The soaking doesn’t require too much time, and it’s idle work. Just toss the figs and coffee in a bowl, and be on your merry way to dipping bacon in chocolate. Bigger priorities. 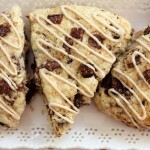 Once the prep work for the bacon and figs is out of the way, you are smooth sailing to slap these scones together. 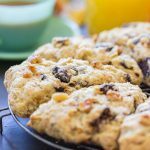 These are a very decadent and rich scone, as close to ‘gourmet’ as I personally know how to make something. I use the word ‘gourmet’ loosely here, but they had so much robust flavor from coffee, chocolate, espresso beans, figs, bacon… felt like something I could almost purchase at a fancier bakery. 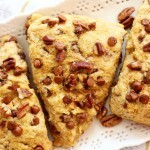 My favorite scone yet! 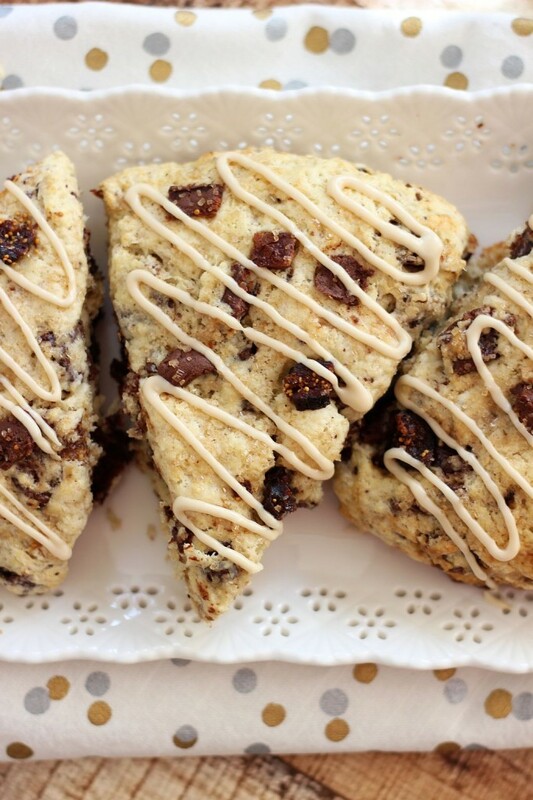 Scones chock-full of chocolate covered bacon, crushed espresso beans, and coffee-soaked figs. 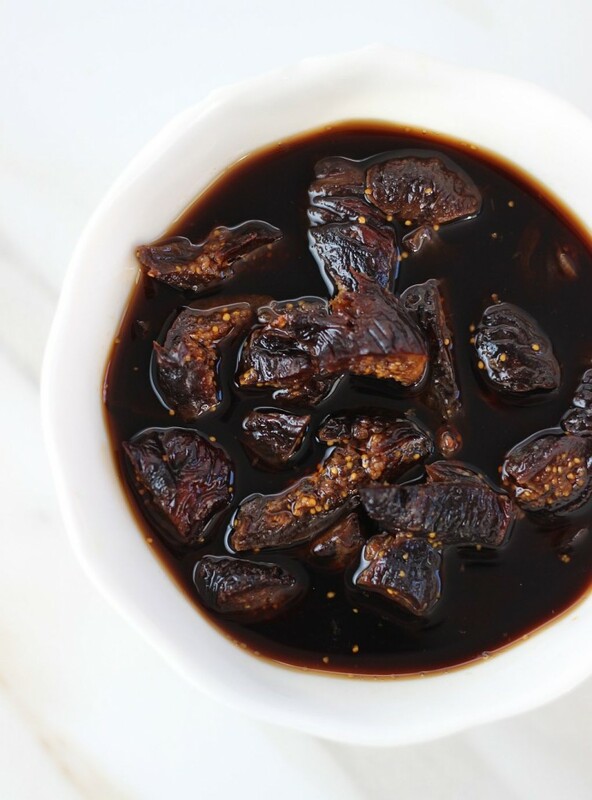 In a medium bowl, combine chopped figs and coffee. Set aside, and allow to soak for at least an hour. After soaking, drain the figs thoroughly. Reserve the coffee. Meanwhile, in a small saucepan on low heat, melt together chocolate chips and shortening. Whisk til smooth, and remove from heat. Using tongs, dunk each piece of bacon in the melted chocolate, covering both sides. 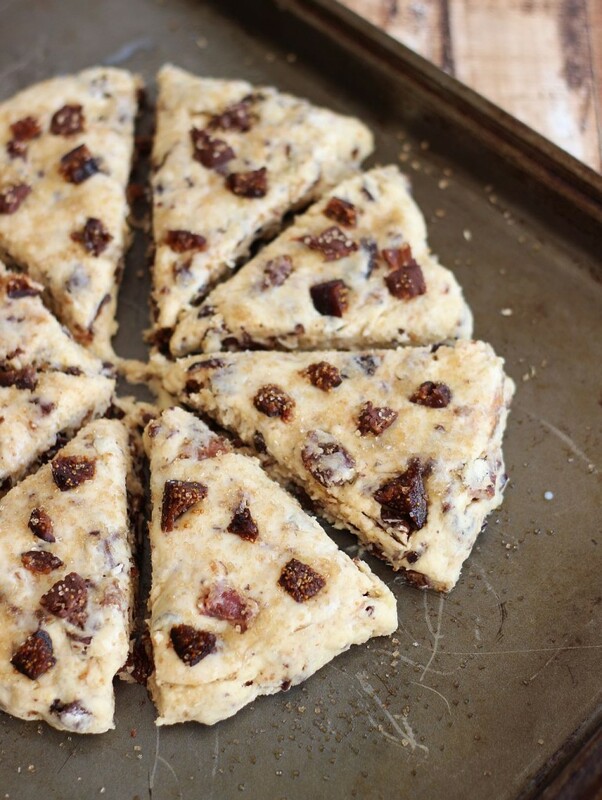 Tap off any excess chocolate, and place the bacon on a sheet of parchment paper. Allow to set - approximately 30 minutes (you can refrigerate to speed up the process). Once the chocolate has set, chop the chocolate-covered bacon into 1/4-inch pieces. In a small bowl, whisk together powdered sugar and coffee. Drizzle over cooled scones. Enjoy! This is so unique and different. I love it! 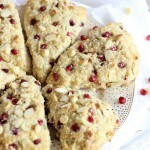 I wish I had one of these scones for breakfast! Thank you, Jen! I don’t know what I was thinking on these, but they were excellent! Haha! Very cool idea Sarah! Need to try these asap! I love the creativity here, Sarah! I definitely saw “Chocolate Covered Bacon” and stopped in my tracks! Hahaha, interesting is exactly what I thought when I read that title! 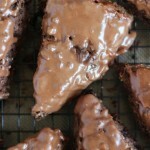 These are totally cool Sarah, I never would have come up with that, but I’m sure they’re totally decadent and wonderful! Yeah, I don’t know what I was thinking. But at least they turned out really good! That’s what counts, I guess! We loved them. Thanks, Stacey! Wow Sarah, how in the world did you come up with these flavors to combine?!? No clue. It’s an odd combo, I know. But it totally worked!!! These scones are so creative, Sarah! I absolutely love the flavors! Bacon, espresso and figs is pure genius! And I’m sure they smelled amazing when baking, too! Thanks, Gayle! It smelled like bacon for a long while. Haha! How delicious! 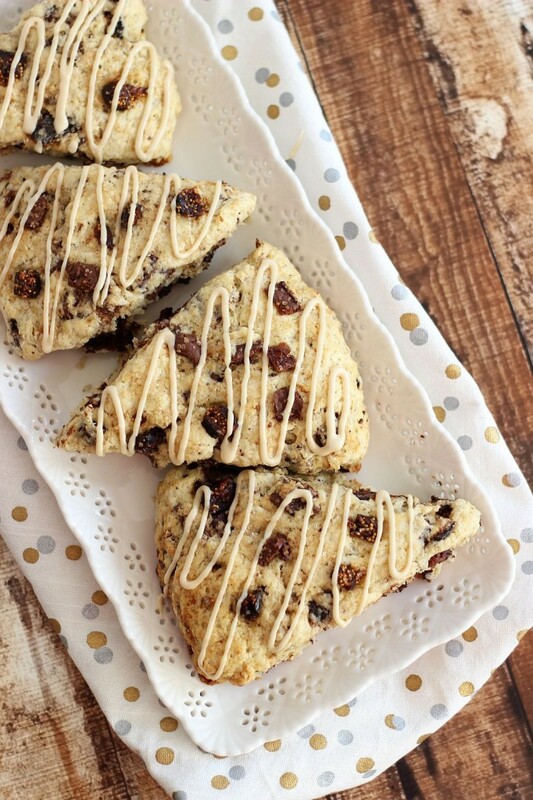 Your scones sound so flavorful – what great flavor combinations! Wow! How interesting. I did feel that the name chocolate covered bacon drew me it. Wish I could taste this right now! Thank you for sharing at Snickerdoodle!! Different, huh? They’re awesome though! Thank you, Elizabeth! Ok. Wow. Just WOW. How strangely appealing after reading your post. i’m convinced. They look wonderful and we love all the different parts. I’ll try it! Thanks for linking up at #PureBloglove link Party! Yes, I know they sound really different and unusual, but they taste amazing! Thanks, Diane!